Winning A TEDx contest: Is it tough? 13 June 2017. A red letter day. After qualifying pre-selection rounds I was invited by TEDxRotterdam to give a five-minute pitch on my idea worth sharing. Should you win, you will be a speaker at the main TEDxRotterdam event, standing on the grand stage of De Doelen on 3rd of November. The line-up was incredible; innovative architechts, bio-hackers, researchers, gender diversity speakers and inspirational stories of struggle and success. So does a pitch become easy if you’re a good speaker or an expert on your topic? This is the number one reason why brilliant ideas and proposals fail to connect with clients and investors in the industry. We think its much easier than it really is. All the work you put into your dream idea- the conception, the plans of execution and impact… the last and final step is pitching it. Yet, that short talk can sink your stable boat within seconds. In later articles I will give a breakdown on HOW to create a ‘pitch to win‘. Today, I’ll share two points, that you need to be aware of, before preparing a pitch. 1. Do Not Wing It. You’d think if you’re 1) an expert, 2) good at speaking, 3) have spoken at length on your subject… what’s a mere minute or five? Many go on stage or present to investors with a general idea of what to say, and go off the cuff just a bit. Many are confident that their charm and jokes on stage will sail ’em through. That’s signing a death warrant on your proposal. I’ve given lengthy keynotes, workshops that went on for hours, yet this was the toughest speech I’ve delivered in a very long time. You have very little time to interest an audience who has seen & heard it all. Be fully aware of the impact of each. spoken. word. 2. Find Fat Where There Is None. Too many pitches that have promising ideas just don’t ‘connect’, according to the audience. The reason being – too much fat. I always use the example of Michelangelo’s David. David did not get cheat days. Just like Michelangelo sculpting a stone to create the timeless legacy of David, you have to sculpt your pitch that will be remembered long after you’re done talking. What was essentially a piece of carved stone, transformed into a symbol of identity, emotion and impact. Similarly, when you’re planning your pitch, you’re looking to sculpt a piece of text that fascinates, emotes and inspires your audience. Your impact should make the audience rise beyond just your speech, and start seeing their core values reflect in it. Thus, every punctuation, pause and syllable needs to be measured and weighed. If it is not elevating your pitch story from the second before, discard it. I’d like to end by sharing that it took me seven days, 10 drafts and 20 practice rounds to get pitch perfect, for all of five minutes on the final stage. Would love to share the video, but I’d rather share the final speech that will happen in November. Until then, wish you all the best with your talks. Remember, your pitch is your crowning moment. Do it justice. Are you planning to pitch or present a high-stakes proposal? What is your biggest challenge? Let me know in comments below. Sangbreeta Moitra is an award-winning speaker on corporate storytelling, powerful persuasive speaking and leadership communication. 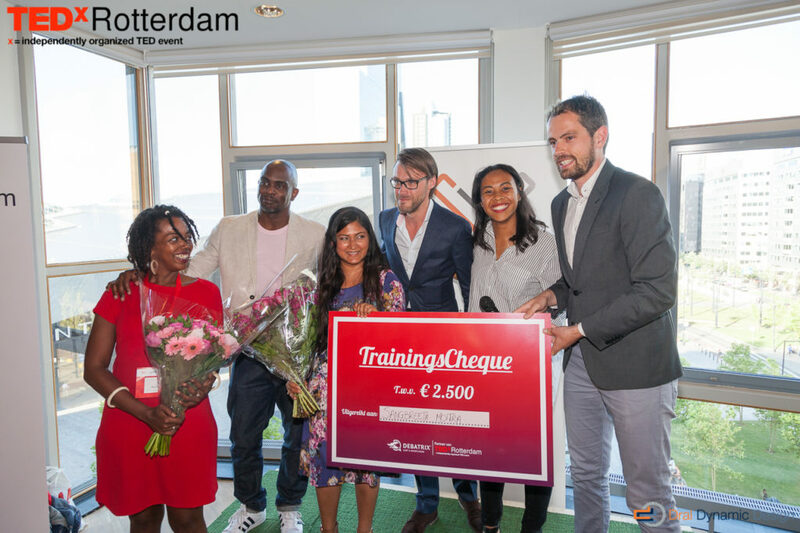 She is the winner of the TEDxRotterdam Open Mic 2017 award, Dutch Champion and European Bronze Winner in Toastmasters public speaking championships in 2013/2014. With the belief that every individual can be a deeply impactful speaker, she collaborates with top corporates and associations across Europe through keynotes and workshops. Alongside, she functions in a leadership role as Global Manager in the pharmaceutical industry. Would you like to have a talk? Contact her at info@sangbreetamoitra.com and have a look at SangbreetaMoitra.com .